Stacy Horn » Blog Archive » Cockroaches Can Jump Now. We’re Doomed. Cockroaches Can Jump Now. We’re Doomed. They’ve been discovered in South Africa, it’s just a matter of time before they make their way over here. I quit. After taking both Saturday and Sunday off, I feel like I really should work today, but come on. It’s a holiday, right? 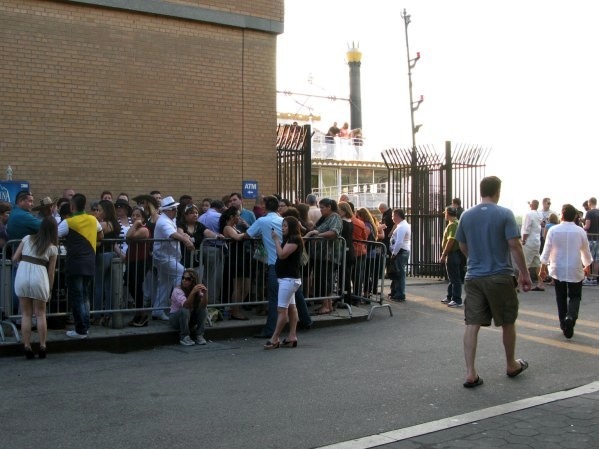 These people were lined up to get on a party boat that never leaves the dock. It must be one really great party because they were waiting a long time, in the heat. Well, I’ll trade our fire ants for the jumping cockroaches any day. The cats can take care of the roaches, but fire ants are a whole ‘nother problem. Fire ants?? That sounds horrible. Dare I google them? Do they come into your house? Do they attack? No house invasion yet.They stay outside, but if you step on them, well, you’ll understand why they are called fire ants. Oh god. Okay, I’ll take the jumping roaches. Can’t believe I typed that.